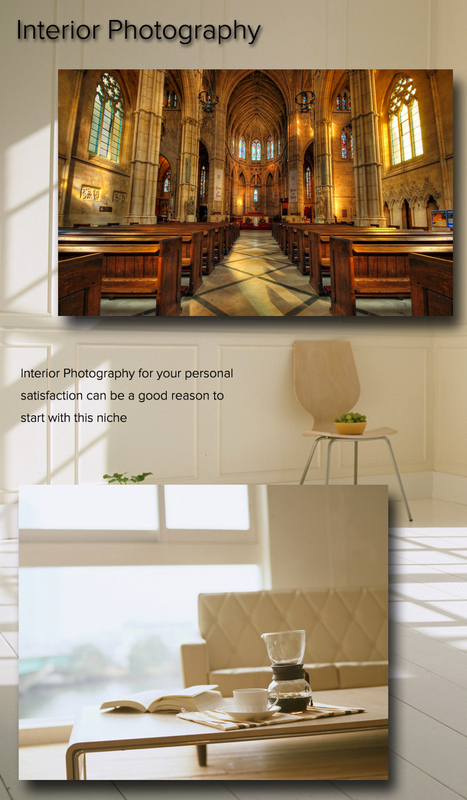 Interior Photography for your personal satisfaction can be a good reason to start with this niche. We have described some tools to get started with Interior Photography. Photographing the interior is a challenge, where the target is to create interest, keeping intact representation of the space. The way of thought for composition is a bit different in case of Interior Photography. Analyze the scene, preparing the interior shots requires more attention, as you have to arrange the things so that people do get distracted. The right light is always the concern of every photographer. When we use the natural light sometimes we just have to wait for the right time. As we written before for composition, it is important to give attention to lines – Vertical Lines in Photographic Composition transmit force, momentum, growth. Diagonal Lines in Composition can lead the eyes of the viewers. Horizontal Lines in Composition can appear naturally in a photo “ the horizon, a fallen tree, an object lying. A wide-angle lens is what usually chosen for Interior Photography. Usually, for Interior Photography; the space – be it office, home or a restaurant; is made free of presence of human. Ambient light makes the interior beautiful. There are different niche of interior photography like interior of office, interior design photography itself is a bigger niche, hotel interior photography and architectural interior photography are other arbitrary divisions. It is important to keep in mind – from carpet to pillow; everything must look as if new. As in real life in our home, we never maintain so much tidiness, may be during some upcoming occasion when you clean up and arrange your interiors can be a great time to experiment with interior photography. This Article Has Been Shared 6893 Times! Lens Adapter to Mount Film SLR Lens on DSLR Needs Due Carefulness to Select as Not All Lenses Can Be Mounted on All Kind of Bodies. Cite this article as: Abhishek Ghosh, "Interior Photography : Getting Started," in The Customize Windows, February 22, 2014, April 21, 2019, https://thecustomizewindows.com/2014/02/interior-photography-getting-started/.